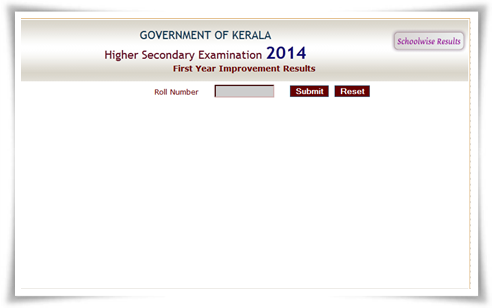 Kerala DHSE Plus One 2014 revaluation/improvement results has been published today (15th October 2014) at the official website. Students who have appeared for the exam can check their results through the link http://keralaresults.nic.in/dhsefyimp14/dhsefy_imprv.htm. Kerala Plus One 2014 school wise result is also available at the official website. The Kerala state Board of Higher Secondary Education published the Plus One 2014 revaluation/improvement results been today (15th October 2014) at the official website. Candidates who have appeared for the exam can check their results online. The school wise result is also available at the DHSE website. The result of the first year vocational higher secondary examination conducted in August has also been announced. The examination was conducted from 4th August - 11th August 2014 in all the examination centers in Kerala and Lakshadweep and in the selected centre in the Gulf countries. Through the online facility, students can check their results in a mouse click. To know the results, students have to submit the roll number in the given space. By providing the school code, the complete list of students appeared for the exam along with their results will be available in the website. As the web portal is exclusively designed to deliver the result, students can check their marks without much effort. Meanwhile, the Higher Secondary Education (DHSE) has published the final year examination timetable to be conducted in March 2015. As per the schedule, the exam is proposed to begin on 9th March and end on 30th March 2015. The practical evaluation based on the scheme and syllabus prescribed for the Higher Secondary Course during 2013 – 2015 will also be conducted during February / March 2015. The time table for practical evaluation shall be made available by the schools. It is very important to note that, to become eligible for higher studies, a candidate should obtain D+ grade or above in all subjects. The minimum score required for terminal evaluation for subjects with practical evaluation is fixed to 36 and for subjects without Practical Evaluation it is 48. Students should keep a close eye on the official website of DHSE to know the timetable and latest updates. The results were published on 15th October 2014 and not August 15th 2014 as mentioned above.